One of the Palestinian detainees freed in the latest prisoner exchange-deal with Israel, is scheduled to marry in the capital of Turkey, Ankara, the Turkish daily, Vatan, reported on Friday.Ayman Abu Khalil, aged 39, was one of eleven Palestinians exiled to Turkey, after being released by Israel under the prisoner-exchange deal which saw the release of captured Israeli soldier, Corporal Gilad Shalit. Vatan claims that Khalil has invited the Turkish Prime Minister, Recep Tayyip Erdoğan, to his wedding at the Buyukhanli Park Hotel. . The Turkish daily added that the other ten Palestinians exiled to Turkey will also be among the 200 guests at the wedding. 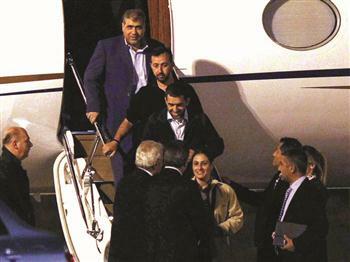 Palestinian Ambassador to Ankara, Nabil Maruf, is also expected to attend the wedding. Khalil spent eighteen years in Israeli jails and was engaged to his relative Ayat Zeyadah, 30, when he was still in prison. According to Vatan, Khalil said he chose to live in Turkey because it was a Muslim country. He said he first received a six month residence permit in Turkey, and all 11 Palestinians stayed together when they first arrived. “Now they have told us that we are free to stay anywhere we want,” said Khalil. He said the Palestinian Authority gave him financial aid but he wants to earn a living from now on. One thousand and fifty Palestinian prisoners were released in the swap-deal with Israel in two stages. The first in November, whereby 477 prisoners were released, exchange for the Israeli soldier, who was captured by Palestinian armed resistance groups on June 25, 2006, in the Gaza Strip. The second phase, the remaining 550 who were chosen solely by Israel, was implemented in December.